In memory of John Kynaston Cross of "Fernclough", Deane M.P. for Bolton, mill owner and Under Secretary of State for India. The first light shows Jesus with his hands together and a dove descending. Above the dove is a hand with finger pointing. The Latin below the hand may be translated "Behold my beloved Son". The picture shows the scene after the Baptism of Jesus in the River Jordan. (St. Matthew Chapter 3; St. Mark Chapter 1; St. Luke Chapter 3). Second light - An angel stooping with a golden chalice. 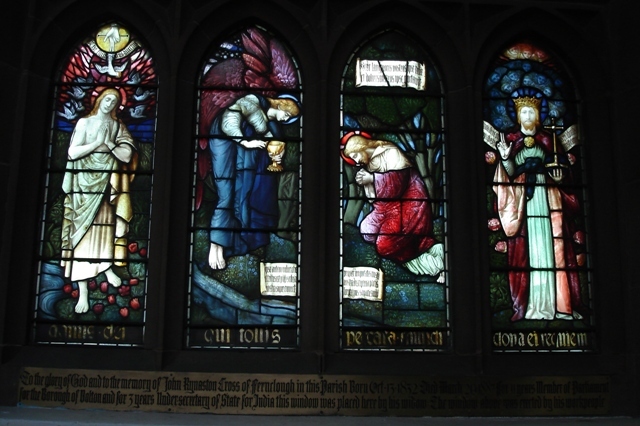 The Latin (lower right) taken in conjunction with that in the lower left of the third light reads "But He was wounded for our transgressions, He was bruised for our iniquities; the chastisement of our peace was upon Him; and with his stripes we are healed". Third light - Jesus is kneeling, praying in the Garden of Gethsemane. There are flowers in the foreground and trees towards the back. The Latin in the upper half of the picture reads "He bore our weakness Himself and took away our grief Himself". Fourth light - Jesus is wearing a crown, as "King", giving His blessing and holding an orb with a cross, in His left hand. The Latin on the scroll reads "Come to me all who labour and are heavy burdened. I will give you rest". 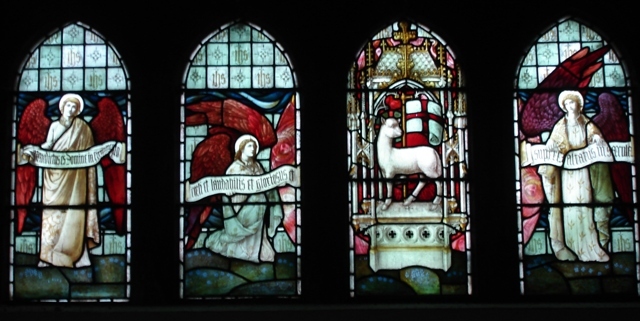 The Latin along the bottom of the window reads:- "Lamb of God, who takes away the sins of the world give it peace". Above the Kynaston Cross window is a 4-light clerestory window. Angels are depicted in the 1st, 2nd and 4th lights, and a sacrificial lamb with a red cross flag in the 3rd. the Latin above the 1st, 2nd and 4th reads "You are blessed Lord, in the firmament of the sky and worthy of praise and glory, and exalted on high through the ages".